A Soup Both Heavenly and Diabolic: Margarita, You’re In! Margarita – chatty and charming, yes, but can her calabacitas and caldo de camarón deliver me into the many heavens of Mexican cuisine? Some weeks ago, one of our staff nominated a new member for our recently launched Émigré Gourmet cooking collective. Margarita, we were assured, is a fine Mexican cook who knows all the ins and outs of the classic Mexican favorites. This sounded good, but could she put the proverbial frying pan onto the proverbial fire and turn out something fantastic? Margarita was friendly, upbeat and seemed to talk a good game. She had an impressive menu of Mexican deliciousness and claimed that I could pick any dish on her arm-long list and she could show me how it was done. Satisfied with her sounding like the real thing, I made a date for two cooking classes. At the first one, we made calabacitas con crema (zucchini with sour cream) and caldo de camarón (shrimp soup), and at the second, we took a stab at the elusive, intimidating sounding chicken in pipian verde sauce. Pipian verde, a green pumpkin seed sauce, seemed esoteric to me that I wasn’t sure I would be able to capture its true essence, but Margarita seemed utterly confident. A week later, we met and went to work. Calabacitas con crema were lovely, soft, velvety lumps of zucchini, the kind of food you would want on the side of a spicy main dish. Margarita bemoaned the lack of tang and salt in the American sour cream, explaining that if I wanted to get the best taste, I should get to a Mexican bodega and purchase the Tapa Maria brand, which has a different sensibility than its American cousin. 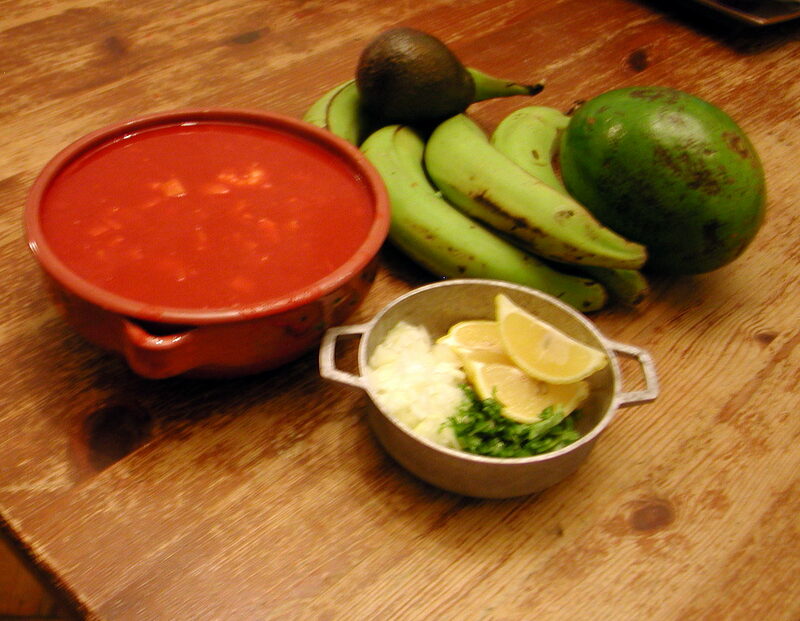 The caldo de camarón was a tour de force. I finally was able to learn the secret behind a smoky, slightly hot, red guajillo chile sauce with its complex taste of cinnamon and nutmeg – curiously, the perfect complement to sea food. The recipes were completely successful, and Margarita received my unqualified recommendation to the membership of Émigré. The show was not over, however, and our pipian verde session turned out to be everything I had hoped for and more. I had never cooked with dried, ground pumpkin seeds, and fresh “oja de santo” leaves that had a lemony, grassy fresh green smell that was utterly unlike any American flower or herb I was familiar with. While the techniques in developing the sauce reminded me of developing the layered flavors of south Indian curries, the dish was for me a culinary lesson in taste, layered with sour, green, bready flavors that emerged successively as the tastes spread across the tongue. Poured over a plain, pedestrian boiled chicken, it became the perfect meal and a mild foil for the dynamic sauce. Can Margarita cook? Si! Mais oui! I’ll say!! Peel the carrots and potatoes. Cut carrots lengthwise, and then cut each half again, yielding 4 long carrot sticks, then cut into ¾” dice. Cut potato into same size dice. Combine carrot and potato in a bowl. Using rubber gloves, take dried chiles, remove and discard stems, and rip the chilies into small pieces. Place the chilies in a small pot and cover with about 1 ½ cups of water. Bring to a boil, lower heat and cook for 10 minutes until the chilies are soft. Pour chiles and cooking water into a blender, add the garlic and spices and onion and blend very well, for at least 1 minute. Heat one tablespoon of olive oil in a 2 quart saucepan and when oil is well heated, pour the contents of the blender through a fine sieve, directly into the heated oil. This lightly cooks the sauce and gives it a more finished flavor. Press the contents of the sieve gently against the sides of the sieve to extract the liquid, leaving behind the skin and seeds from the chiles. Add additional water, up to 2 cups, to extract all of the available liquid from the skin and seeds in the sieve. When you are finished, you will have enough broth for the soup, about 2 quarts, and you should be able to see the white seeds clearly in the remaining pulp. Bring broth to a boil and add the carrots and potato, reduce heat and simmer for about 35 minutes or until carrots and potato are soft. Add the shrimp and cook for an additional 10 minutes until shrimp, and fish if you are opting to use fish, are both cooked through. Taste and adjust for additional salt. Serve in a tureen or in individual bowls. Each portion can be individually garnished with any combination of the garnishes, to the taste of the person being served. I love cooking. Thank you for this writing.